We all know that the grand dame of hotels in Manila is the venerable Manila Hotel that overlooks the bay and the Luneta. So much of our city’s history has involved this once staid and resplendent landmark that we may forget that at one time, there was another first class hotel that was the only one considered quite elegant enough to attract foreign tourists arriving in Manila as well as being linked with its own history. The Hotel de Oriente was built in 1889 by Don Manuel Perez Marqueti, the father of Luis Perez Samanillo, owner of the Perez Samanillo building in Escolta. It was a first class hotel and indeed, at one time was the only one in the entire archipelago. Don Perez Marqueti selected the site in Binondo at the Plaza Calderon de la Barca (now Plaza Lorenzo Ruiz) next to the La Insular Cigarette and Cigar Factory. Its location was quite convenient, just a few blocks off the docks of the Pasig, next to the Chinese retail businesses and close to the busy Escolta shopping district, as well as the old walled city of Intramuros. The Spanish architect Juan Jose Huervas y Arizmendi, who also designed the La Insular building, was commissioned to design the hotel at a cost of $100,000. It had three floors with 83 rooms, stables for 25 horses, an attic, and a broad entrance floored and roofed in red clay tiles. It was an elegant building with seven bays along its front. On the ground floor was a narrow arcade with Moorish arches, with the arch on the central bay rising to the top of the second floor. The windows and ventanillas on the lower floor were protected by iron grilles. 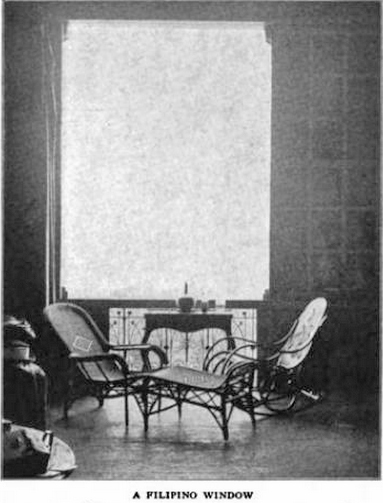 There were windows also on the entresuelo (mezzanine). The windows on the upper floor had sliding glass shutters and ventanillas with iron grilles. 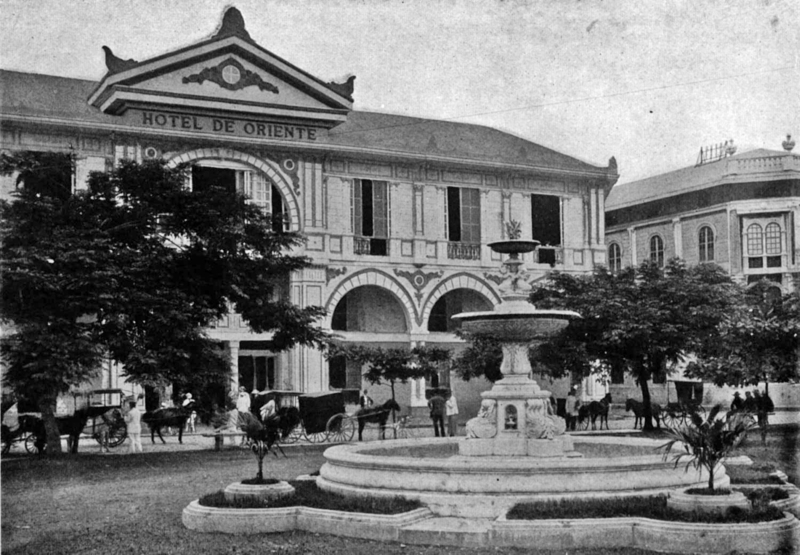 The Hotel de Oriente was considered plush for its day and thought to be the Philippines’ best lodging in 1899 by American first-timers to the Philippines. Its strategic location near the church of Binondo and the pretty view of the Plaza Calderon de la Barca’s manicured lawns and fountains, the Estero de Reina and the San Fernando Bridge contributed to its fame as the best hotel in Manila. This was the most prestigious hotel in Manila where most of the newly arrived American officer’s wives lived. Carriages await in the street in front of the hotel, and at the entrance may be seen a group of army officers in khaki uniform, in white and gold, or very much modern, olive drab. The dining room is entered through the rustling beadwork curtain. Here the Chinese waiters, in long gowns glide noiselessly around. 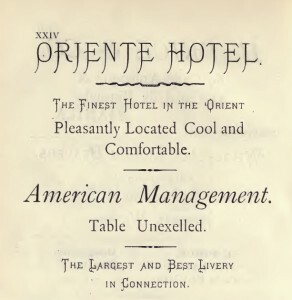 In 1899, the options for fine cuisine were few but the Hotel Oriente was known for its first class service and admirable cooking. Beside the leading dishes of the French cuisine, it served the national dishes of Spain so as to captivate the most fastidious eater. A food critic of the time describes their menu. 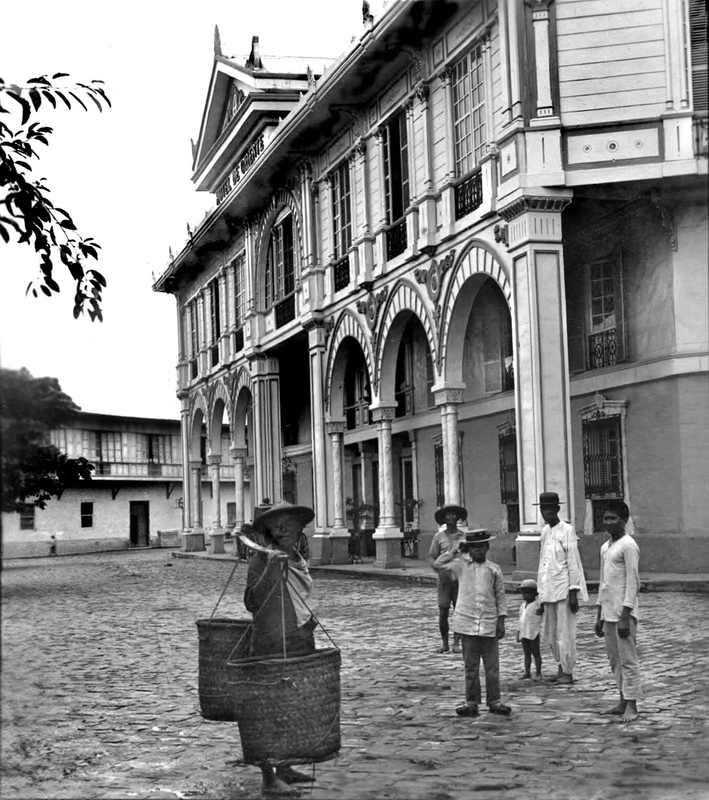 A first hand account states that after arriving in Manila, he was led by guides to his accommodations at the Hotel de Oriente, “Our way led directly towards the north, through the Calle Rosario, headquarters of Chinese merchants. We could not stop at any of the dirty, cramped yet attractive bazaars; we kept steadily on trying to see, and at the same time trying to avoid collision with the Filipinos, Spaniards, Chinamen, American soldiers, and who knows whom else obstructing the sidewalk. We managed however to avoid serious collision; to follow closely to our luggage-bearers, and to emerge with them at length into the freer space of the Plaza Calderon, right under the walls of a great church (Binondo Church), that except for its shabby looks, Aladdin might have transported as a whole from some old town of southern Europe. To eyes fresh from the north and the sea, it was as though they had been opened in medieval Spain. Just beyond the church arose the huge, almost palatial-looking, tobacco factory, “La Insular”, opposite which, across the street, stood the house of our search, the “Hotel de Oriente”. Crossing the San Fernando bridge over Estero de Reina. 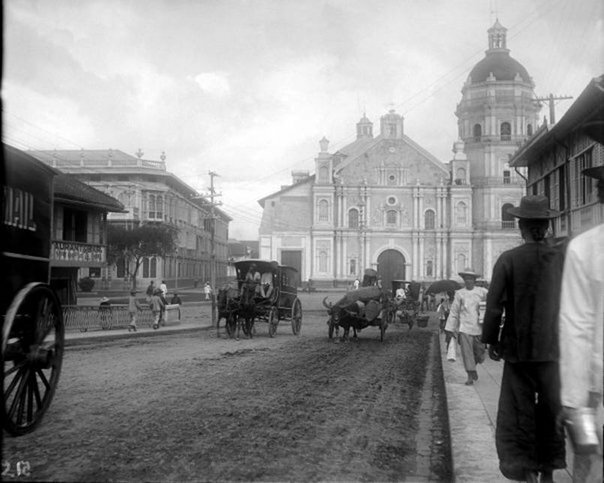 Binondo Church in the background – 1890. Hooked rugs covered much of the wooden floor, and the large bedrooms had several rattan wicker chairs. Two ceiling fans revolved slowly, circulating the air. 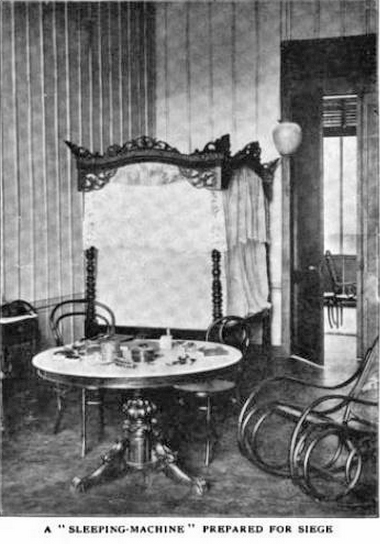 The Hotel Oriente was one of the few dwellings in Manila with electricity. The long, black blades of the ceiling fans turned silently, the heavy electric motors performing a never-ending service. The “sleeping machine” – 4 poster with mosquito netting. The hotel is also known for its most famous guest. 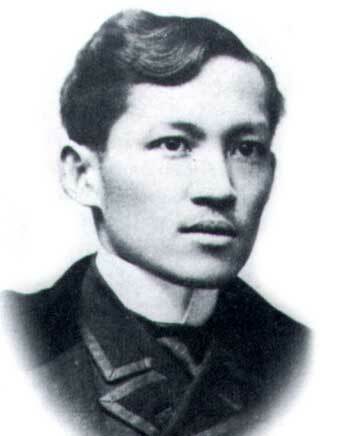 In June 26, 1892, Jose Rizal arrived in the Philippines from Hong Kong on board the boat Don Juan. After having been inspected by the custom men, he went to the Oriente Hotel where he occupied room No. 22, facing the Binondo church. 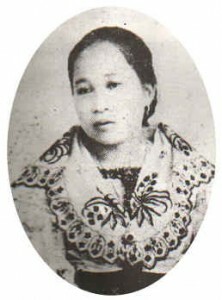 His sister, Lucia, accompanied him in his return to the Philippines. 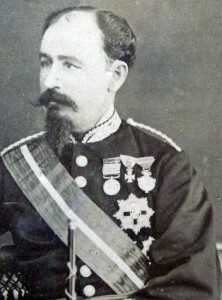 Rizal began to establish daily conferences with the Spanish Governor General Despujol to lift the order of exile against his sisters. Based on supposed evidence of anti-friar bills found in sister Lucia’s baggage, Despujol later issued a decree on July 7, 1892, banishing Jose Rizal to Dapitan, Zamboanga. Don Manuel Perez Marqueti passed away and his widow sold the hotel in 1899 for $160,000. Walter Fitton, an Australian speculator bought it in 1900 for $350,000. Fitton sold it to Sellner’s Manila Investment Co., which leased it to Ah Gong, a Chinese food and wine distributor. Ah Gong was well-travelled and well known in Manila as a restauranteur, food purveyor, having a large store on Calle Echague. He was an ex-Navy man, spoke English fluently and was said to even own a large ranch in Nebraska. 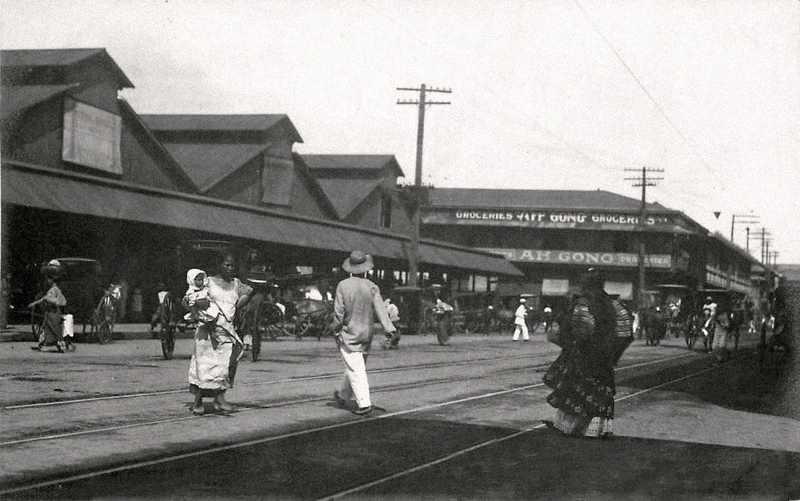 When the Americans arrived in Manila in 1898, they found a Spanish city with a strong European influence. The walled city of Intramuros was patterned originally after a medieval fortress complete with walls and surrounding moat and gates with draw bridges. The Spanish lived within the walls in magnificent residences with their protruding balconies. The native Filipinos and Chinese lived outside the walls in surrounding villages. 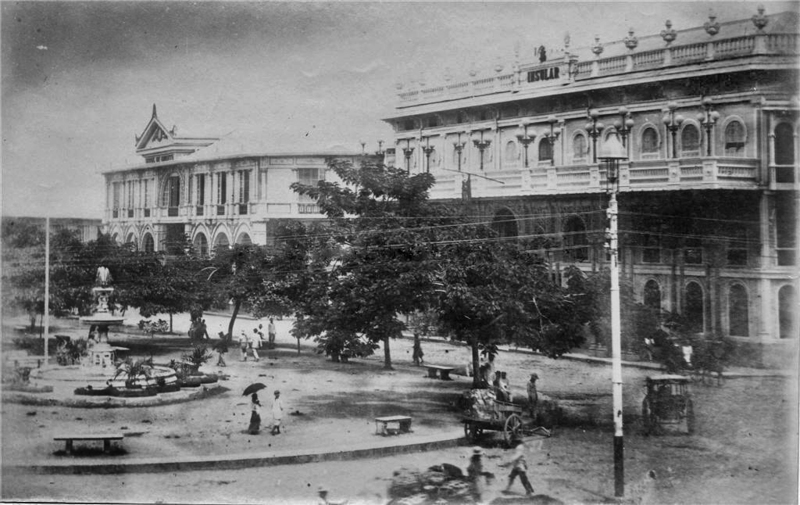 The succeeding American colonial administration found it necessary to leave their imprint on the city scene to redevelop Manila for it to acquire an American character and make it more suitable and attractive to Americans wanting to invest and live in the city to pursue career or business plans. 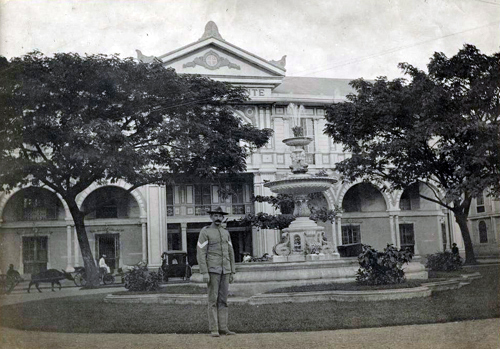 One of the early acts of the Philippine Commission was to assign architect Edgar Bourne in 1903 to purchase the Oriente Hotel for $675,000. The hotel was the favorite lodging house of foreign guests albeit not very well conducted by Ah Gong but it was the only important hotel in the city of sufficient size and dignity to induce the coming of tourists. The Commission then started planning for a bigger hotel along the scenic Manila Bay. The long awaited opening of the Manila Hotel, hailed as “the finest hotel in the Far East”, occurred July 4, 1912. I just happened to stumble upon your website as I was looking for old pictures of Binondo, particularly the environs around San Fernando bridge. I was pleasantly surprised to find not only what I was looking for, but also a treasure trove of information about old buildings that, alas, I have only learned to love and admire in faded pictures of black and white. Much like you, good sir, I lament the fact that old Manila is simply a forgotten relic nowadays; however, I also bear the excruciating pain of belonging to a generation which holds no love for things old and gone. Forever will I love the Manila I never got the chance to see. Thank you for doing your best to keep its memories alive. Thank you for your very kind comments. It’s my pleasure. Thanks so much for the beautiful pictures and write up. I am 71 and am truly regretful to see these pictures and the explanations with them. Hi! I was happy to finally see a stream of new entries for reading. I once spent a the whole afternoon reading entries until I got to the very first one. Thank you! I love all your entries and it’s such a shame how some of the landmarks and buildings mentioned here have fallen to disrepair. It’s a shame for us generation (I’m in my late 20’s) not to see them anymore or what’s left of it. It’s quite saddening for me that Filipinos have no respect for iconic structures that just proves our country’s past grandeur. Sayang. Yes, it takes a bit of time to collect the photos and histories for me to produce another post. Also, I welcome any ideas for new posts. There is a wealth of material out there but I also don’t want to duplicate what some of the other bloggers have already done – and, they do it pretty well too ! Thank you for your continuing interest in our city’s history. I also think you should have a post about the PNR railroad and its stations. I was always curious how the old PNR station along Osmena Highway (is it Osmena? The one with the nice clock and columns). Thanks! Thank you for your comments Maria and to those people who took pictures of Manila back in the day to remind us of what it used to be. I like your idea of the railroad too! That PNR Station across Plaza Dilaw (I think)? Sublime, don’t you find? In the mid 90s I remember going to that station to take an all nighter train to Bicol to attend a wedding, purposely shunning PAL to my friend’s aghast in order for me to try to relive what I only used to hear about. It was a long ride best left to stories heard haha but lo and behold, the next Bicol trip out of that station was derailed right there and then, on its way out! Unfortunately, that sublime structure was also a victim of our wantoness right about the same time or a little later than the Sky Room at Taft Avenue. If I am not mistaken, the building has already been gutted (to give way to a structure that was started but never finished and now looks like a canker sore) with the facade on the brink of total obliteration, if at all! You can still visit the hotel de orient at las casas filipinas bataan . Heritage homes and jose rizal’s home is also there . We went there yesterday. This blogpost particularly left a smile on my lips as I read its end; it was light on the heart as compared to the other posts that evoke a lot of regret for everything we have lost and the lessons never learned. The quotes were like a timescope inducing a kaleidoscopic feeling of being there, as it were. A truly wonderful experience of a time in Manila that no one can experience except through those wonderful memoirs, critiques & opinions of people of the era; warmly & wonderfully presented. Reading a blog from someone who lived in prewar Manila trumps all other blogs that were written based only from secondary sources. Truly, a priceless read. What a delightful way to put it. Thank you for your very kind comments! Very interesting story about historical sites. Thank you. Thank you for the data on something important in our history. Manila indeed was the Pearl of the Orient. Thanks a lot for reminding me of my past he he he Excelente!!!! Another brilliant account of a historical treasure, Lou. The link to Rizal is precious. Many thanks and more power to you! Correction, The first owner of the hotel was not Don Miguel Perez, his name was Don Manuel Perez Marqueti, the father of Luis Perez Samanillo, owner of the Perez Samanillo building in Escolta. First cousin of my greatgrandfather Jose Maria Arriola Samanillo of Paco, Manila. Thank you. I will update the article. Thanks for correcting this info – it’s important that I get it right. Most of my research comes from the internet which I’ve found isn’t always valid. 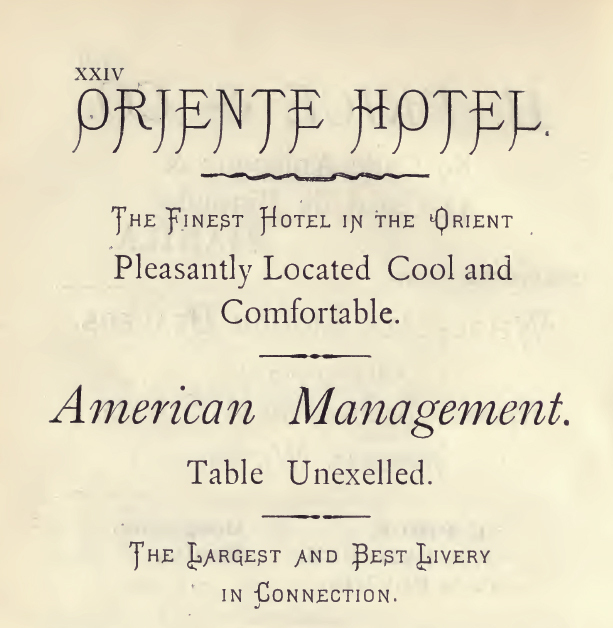 Thank you for the information on Hotel de Oriente. In fact, we need people like you to enlighten us more on the hotel as we want to make it as faithful as it can be to the original building. Please do contact us by email reserve@lascasasfilipinas.com so we can arrange a meeting. Thank you and good day! Jerry Acuzar is rebuilding the Hotel de Oriente at Las Casas de Acuzar in Bagac, Bataan. I went a couple months ago and its core skeleton is already up, I’m sure it has further progressed since. The restored(?) Hotel de Oriente will be located in the Binondo section of the estate, next to a recreated bridge right by the beach. His Binondo section is quite fascinating – many houses and buildings are up already – an interesting recreation of Old Manila. He even managed to show pictures of the Hotel’s old interiors and I believe a grand ballroom too. This is rumored to be site of the APEC 2015 meetings. It may not be the real deal but I am excited to see how faithfully they will restore this hotel. Thank you for putting up this site as i work just across the plaza for the past 40 years and am glad to know this sort of information.. The above photo shows the rebirth of the Hotel de Oriente at the Las Casas Filipinas de Acuzar in Bagac, Bataan. It is currently being finished in time for the APEC sessions in June, 2015. Yes, the APEC Workshop on Fiscal Management and the APEC Senior Finance Ministers’Meeting (SFOM) were held in the newly-opened, newly restored Hotel de Oriente in Las Casa Filipinas de Acuzar from 9-12 June 2015. It is a beautiful work of art—full of statues, wood carvings, pictures rendered in wood mosaic, stairs with floral designs. We held the Workshop in the ground floor, the SFOM in the second floor and had bilateral meetings at the third floor. The meeting was well-attended with 98 foreign participants plus more than a hundred Filipino attendees and support staff assisting us. He leído y disfrutado la descripción histórica del Hotel Oriente. Mi abuelo fue el último Gobernador español en Ilocos Nortes e Ilocos Sur. En sus memorias escribió que “al llegar a Manila, nos hospedamos en el Hotel Oriente. De ahí, volvimos a España”. My GrandFather, -Enrique Polo- sleep in Hotel de Oriente from May 1. 1.900 to May 27, 1.900. In May 27 take The Spanish Ship Leon XIII, from Manila to Barcelona, Spain. Do you have The récord? hi would like to know if you have the interior look of hotel de oriente? This is the part of the interior today of Hotel de Oriente in Las Casas Filipinas de Acuzar. I don’t know if its a faithful reproduction of the original but it looked grand. Oops. I thought the pictures in my FB page of the reproduction of the hotel would also be shown. May I request of where you got the information in this article? I would like to use it as reference in my study.